Mosman’s street names remember – among other things – an artist who went on to become marine painter to Queen Victoria, a member of the first Australian cricket team to go abroad (who bowled with some success at Lords, 1878) and the New Zealand-born inventor of the metal boot-lace. These stories come down to us thanks to Dalton “Jack” Carroll, local business man (his real estate firm P. Leahy & Co still operates in Mosman) and Mayor, alderman and historian 1915-1964. 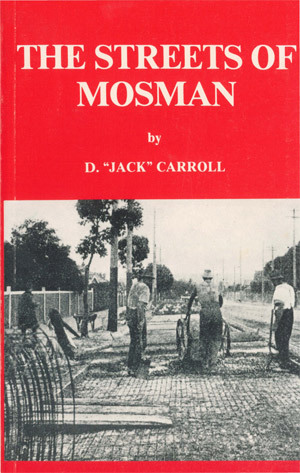 He published The Streets of Mosman in December 1948, with a revised second edition produced by the Mosman Historical Society in 1981. Inspired by two librarians at Sutherland Shire Council and City of Botany Bay, we scanned Carroll’s list of street names, rendered the images to text with optical character recognition and did some basic scripting to generate from each description an address that Google would recognise. Using Google Fusion Tables (and some hand editing to tidy up streets that no longer exist) we mapped Carroll’s street names to this cartographic view of Mosman. Thanks for your comment Ron, and we’ve updated the post. Did you have a sister named Beverly?